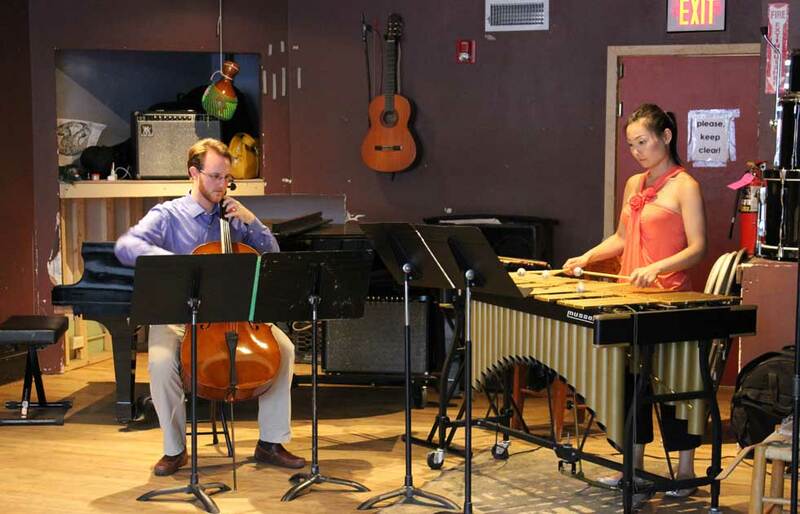 Boston has its fair share of contemporary music ensembles and new music concert presenters, but few organizations offer the diversity of activity that Equilibrium Concert Series has planned for this spring. Only in its second season, EQ has hosted a handful of performing groups from out of town, featured an eclectic bunch of local experimental musicians, initiated multimedia arts collaborations, programmed dozens of new works by local composers, and has now assembled a resident chamber ensemble. I sat down with EQ directors Mischa Salkind-Pearl and Zoe Kemmerling to talk about what their organization has done (and hopes to do) in the Boston new music scene, and to hear about a very exciting set of upcoming events. The mission of EQ is a broad one. In March, they’re hosting the New York City-based Iktus Percussion Quartet this very Saturday, March 16th, at Boston Conservatory. The ensemble was excited about coming to Boston to perform, and also about adding to their repertoire, so they’re using the opportunity to present a program consisting largely of Boston-based composers. They’ll also be hosting a presentation of the homemade electronic instruments that are a specialty of Levy Lorenzo, a NYC composer who will also make an appearance on the program. EQ is also working on a series of concerts based on the works of the late Boston-based painter Hyman Bloom. Their first season featured two concerts at the Alpha Gallery on Newbury Street, performed amid the first posthumous exhibition of Bloom’s work, and they plan to continue presenting events as part of this unique collaboration. Perhaps the biggest upcoming venture features members of the Equilibrium Ensemble, a core group of players who have been collaborating since EQ’s inception. They will perform new chamber works by Chaya Czernowin, Marti Epstein, and Yu-Hui Chang on March 30th. In discussing upcoming composer collaborations, Zoe noted that “they’re all established local composers with dynamic careers, but they’re enthusiastic about working with us during the rehearsal process.” EQ Ensemble members will perform again with local soprano Aliana de la Guardia on April 27th, in a program featuring works by EQ co-founder Masaki Hasebe and MIT professor Keeril Makan. There’s also a concert featuring Boston-based ensemble Modern Brass on May 3rd, involving a slew of brass quintets by recent and contemporary composers (including yours truly). Yes, it’s a bit of a hodgepodge, but one of the striking things about EQ is their willingness to take risks, to include any and all contemporary styles and genres that they think might appeal to their audience. “People who don’t normally attend contemporary or even classical music concerts at all might really enjoy what we do—we want to make them feel welcome,” says Mischa. He, Zoe, and the other EQ organizers don’t have an aesthetic agenda beyond quality, diversity, and thought provocation—though they do have a mission of local advocacy. More information about Equilibrium’s season, happenings, and goals can be found here. Peter Van Zandt Lane is a widely performed composer of chamber, orchestral, and electroacoustic music. He is currently on faculty at Brandeis University. As part of Equilibrium Concert Series and as a composer, I am thrilled to be able to work with such an amazing group of composers, organizers, and performers. As I see EQ blossom, I grow increasingly excited and proud to be a part of it!